As you may have guessed, there’s a lot of red tape to cross when stepping foot in the gun world. Despite what one may hope, buying or selling a firearm isn’t a simple transaction. There are several gun laws and precautions to take into consideration that apply to both gun shop owners and private sellers. If you’re considering selling a gun to someone privately, we’ve listed a few safety measures below to weigh before making the transaction. You will also find some recommendations and questions to ask yourself if you’re thinking about making an occasional sale or exchanging your firearm privately to someone else. When it comes to selling guns, anyone engaging in the business of manufacturing, importing, or buying and selling firearms or ammunition must have a Federal Firearms License (FFL) by law in order to complete the transaction. Private sellers are not required by law to have an FFL if they do not sell, exchange, or gift firearms on a regular basis. Do I need to perform a background check? Licensed dealers must also perform background checks on the buyers and sellers in some states and abide by other local and national gun laws governing their establishment. During gun transactions, shop owners must have customers complete the Bureau of Alcohol Tobacco and Firearms (ATF) 4473 Form that will require their signature, date of birth, and address, etc. The information on the form can be used to contact the National Instant Criminal Background Check System (NICS) to conduct a formal background check on the customer making the transaction. The result of the background check will determine if the shop should “proceed”, “delay”, or “deny” the transaction. Read: What to know before pawning a firearm to learn more about background checks. In some states, like in Alabama, background checks are not required when an individual is selling a firearm to another individual. However, the person you are selling the firearm to has to be a resident of Alabama for this law to apply. It is not lawful to sell to an out of state resident. So you’ll still want to take precaution with the sale if you’re considering selling to someone you don’t know. What type of record should I keep of the transaction? So if you are wondering if it is legal to sell a firearm, as you can probably gather, yes you are legally allowed to sell a gun to someone privately. However, if you do, it’s important to keep an adequate record of the transaction. To cover yourself, you may write an official bill of sale or get a witness involved for proper documentation to prove that you’re selling the gun. The danger of selling a firearm privately to an individual is that you may not know them ahead of time or even if you do, you won’t know what they will end up doing with the weapon. What happens if a gun I sell is used in a crime? If a firearm you sold is used in a crime and recovered, the Bureau of Alcohol Tobacco and Firearms (ATF) will perform a gun trace on the model and serial number to lead them to the last documented owner. If you last purchased the firearm from a gun shop, the ATF 4473 Form you completed will lead investigators back to you. If investigators ask about the gun you have sold, you will have to prove adequately that it was sold, to whom, and when, etc. What’s the safest way to sell guns? In order to avoid a “your word against theirs” situation, the safest thing to do is to sell it to a license FFL holding pawn shop or a gun broker. Pawn shops that hold a Federal Firearms License are required by law to keep very detailed records of who brings in a firearm, leaves with it, as well as documenting the brand, model type, and serial number of the firearm, etc. Additionally, pawn shops are required to keep these records the entire time they hold the license. If the pawn shop should close, all their records will be shipped to the ATF. 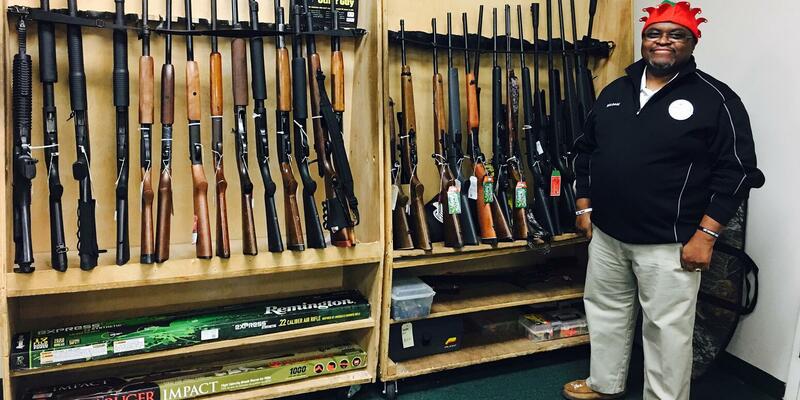 Have more questions about the buying or selling a firearm in Alabama or ready to get started? Quik Pawn Shop is a family owned business with a customer first mentality. They have been operating in 15 Alabama locations for nearly 40 years! Speak to our friendly team at 855-402-PAWN (7296) to get started or click here to find a Quik Pawn Shop near you!